While your own ciphers were probably pretty basic, and your teacher could hack them if they wanted to, it was still a fun secret to share. Codes are a secret, a mystery that appeals to the inner treasure hunter within us all—which is why we love to try and solve them. Check out three of the biggest brain busters below and give them a try if you feel like tying your mind up in knots! What is the Kryptos Sculpture? It makes sense that the CIA commissioned their very own piece of crypto-art that stands proudly out the front of their headquarters in Langley. The Kryptos sculpture, built in 1990, is not only a testament to the cryptographers working behind the scenes on those very grounds, but also makes a striking piece of nature-inspired art. Four different puzzles make up Kryptos, and although an internal CIA analyst solved the first three back in 1998, the answer to the fourth remains unknown. The artist behind Kryptos previously issued clues as to how to solve the final puzzle—such as in 2014 when he said that the 64th to 74th characters, when deciphered, spell the words ‘BERLIN CLOCK’—yet the mystery behind the sculpture remains. 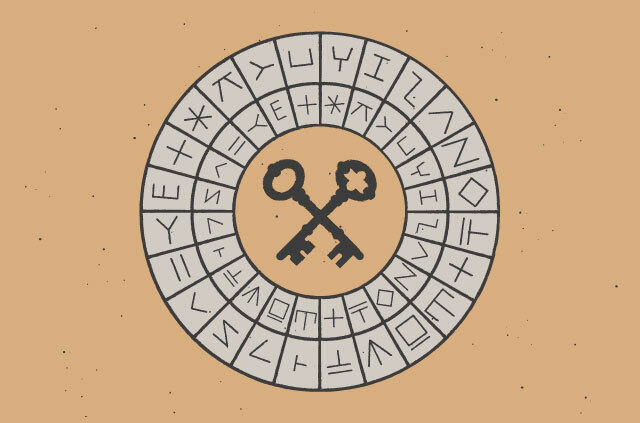 Think you’ve got what it takes to solve Kryptos? See the riddle here. This one is for all you budding herbalists out there. The Voynich manuscript is a 240-page tome scientifically dated back to the 1400s. Its modern discovery was in 1921 when Wilfrid Voynich purchased it from an antique store. The manuscript is handwritten in a strange, unidentified text, accompanied by a variety of illustrations: mostly herbal, but also astrological, and of the human form. The book has passed through many hands, although the originator of the text is unknown. There have been speculations, of course, such as Roger Bacon, a 13th-century friar; Giovanni Fontana, an engineer whose illustrations bear some resemblance to those in the manuscript; and even Voynich himself, in an elaborate fabrication—although this has been proven almost undoubtedly incorrect, due to the radiocarbon dating. View the Voynich Manuscript online at the Beinecke Rare Book & Manuscript Library to see it in all its glory. The Tamam Shud ripping came from a book called Rubáiyát of Omar Khayyam, which investigators would later find in a car. The owner of the vehicle had no clue how it got there and, stranger still, the last page was missing and replaced with a jumble of letters. Was this a cipher from the dead man? There was a phone number included in the scribbles, but the lady who it belonged to denied any knowledge of the mysterious dead man… Very strange! Despite 70 years passing, the Somerton Man’s identity, a cause of death, and the cipher have yet to be determined. There’s even a possible love twist involved, too. Can you solve the Somerton Man mystery? What’s your favorite uncrackable code? Humans love a mystery. And it’s fascinating to learn that many riddles remain unanswered. Is this due to perfect security? Is such a thing possible? Do you know any long-unsolved puzzles? We’d love to hear them in the comments below!